Join the future today and learn digital dentistry. Learn to use CAD/CAM software, scanners, intra-oral scanners, milling machines and 3D printers. Learn anytime/anywhere - online or on your mobile. Learn day or night, whenever you have the time. Self-paced courses let you learn at your own speed. Learning is one thing. But, the world and employers wants to know you learned something. With KedzohDental you earn a Certificate upon successfully completing each course. As everyone knows, the more you know, and the more education you have, the more you can earn. Get certified at KedzohDental and show the world you've mastered the knowledge and earn more. Knowing how to use the tools of your trade where never more critical as now when the entire dental industry is shifting to digital solutions. Do better work and increase your value to your customers and employers and get certified and earn more. Managing a highly qualified workforce has never been more critical. You've invested hundreds of thousands, if not millions, in scanners, CAD/CAM sytems and milling machines. Find out how to increase your productivity and quality by emailing us. If you're a reseller of Exocad, iMetric, WorkNC or any other digital dental solution and are looking for a way to increase your revenues by offering more value to your clients email us to find out more about our affiliate program. Learn how to properly import scanned files and set up your Exocad workspace for the most efficient workflow. Learn how to use the wizard to quickly make crowns, bridges and implants. Learn to step out of the wizard and start using the true power of Exocad to design prosthetic solutions with full customization and make your customers smile. At KedzohDental each course is created and designed by recognized experts. Courses are designed to guide you through each step you'll need to complete a task. Furthermore, course content includes videos, presentations, audio recordings, and pictures - and we always use real patient cases. And, at each step, you'll have quizzes to help you retain what you've learned. By the end, you'll have the knowledge you need to be more productive and better at what you do. This course is for dental technicians and students that are new to digital dentistry and the Exocad CAD/CAM software solution. 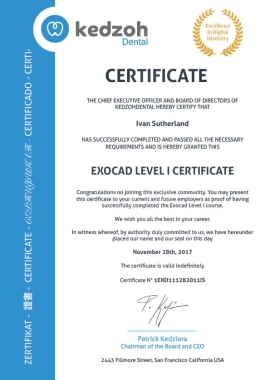 This course is also for those with some experience using Exocad who realize that their initial training was superficial and recognize they need to know the basics in order to become experts. This course is for all dental technicians that want to earn more money by being certified. KedzohDental believes in Democratizing Knowledge™. in digital dentistry. We only pick the best and we only recommend those products that are considered the best among digital dental professionals. Come train with us. Get certified. Earn more. And, become part of this exclusive community. When we went digital with exocad we had no prior CAD/CAM experience, and got fully up to speed with CAD/CAM in just a few days. exocad for us was, and still is, very straightforward and user friendly. Since going digital with exocad, we have been able to expand our customer base, and have grown our business exponentially. Dental Arts Laboratories, Inc. consists of 12 total locations. Throughout, we have 28 total design stations … all exocad. The software is so versatile; intuitive enough for our entry level designers to quickly get to grips with, while powerful enough for our veteran CAD designers and their most complex cases. 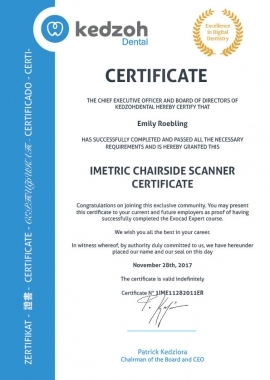 Learn how to use the new 2017 Imetric 3D ChairSide System. Be among the first to be an expert in this system. 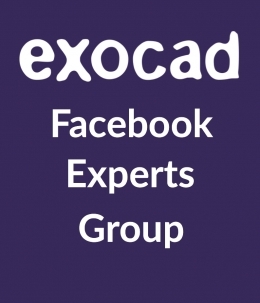 Learn how to use EXOCAD like a true CAD/CAM pro. Work faster. Get better results. Make your customers smile! Get certified and earn more! 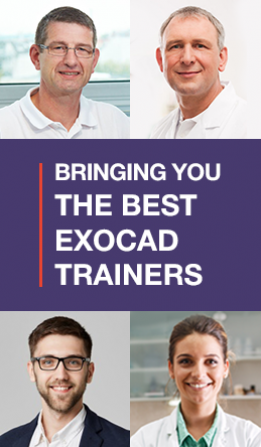 Learn how to use EXOCAD in expert mode. Explore all the options available to you. Become a master craftsman. Make your customers smile! milling machines and 3D printers.